The BBC released its long awaited online TV on demand service last week, which will provide users with access to BBC programmes from the last seven days. Having being originally proposed four years ago, the iPlayer has been a long time coming, and the beta mode is only available to Windows users, something which has annoyed open source groups. Getting the iPlayer started turned to be fraught with problems, and was only managed with the help of the iPlayer message boards, which were full of beta testers with problems. Downloading the iPlayer software itself was easy enough, but then downloading a one hour programme took nearly four hours. On attempting to play the programme, a ‘licence delivery error’ prevented me from watching it. Downloading the latest version of Windows Media Player solved this problem, but it would have been good to know that this was necessary before wasting time downloading updates. That said, the iPlayer looks good, and the controls work intuitively. Picture quality is good too, though it loses a little when viewed in full screen mode. It would have been good to be able to adjust the screen size more, as small screen and full screen are the only two options at the moment. Being the BBC, there is a good range of content, though when the BBC gets round to putting its archive programming online, it will have a choice of content which will be hard to match. Compared with Channel 4’s On Demand service, the download times are slow, though this improves according to the time of day you choose to download your video. 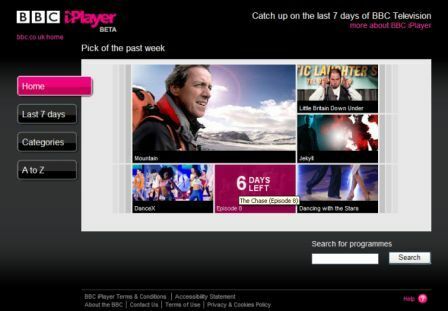 For viewers with cable TV, all the programming on the iPlayer is available on demand anyway, where it can be watched from the comfort of your sofa without the download times.